...the leading progressive political advertising firm in America. We created the startling TV spots that helped MoveOn.org grow from 300,000 to over 5 million members. 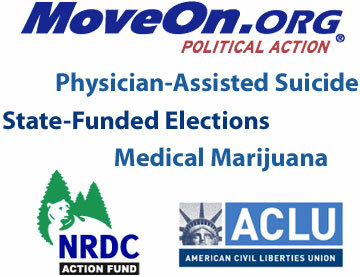 We won historic ballot initiatives that legalized medical marijuana in seven states, instituted physician-assisted suicide in Oregon, and created state-funded elections in Arizona. And, we have given voice to the ACLU, NRDC, PFLAG, the Center for American Progress, and dozens of other progressive organizations.